This is one of the most accurate tools available for D-I-S-Covering your personality style, unlike many of the available assessments offered today. Purpose: To assess adult personality styles with graphs and style blends. Description: Self-scoring personality style analysis designed to define personal style as a basis for self-awareness and understanding. Complete with charts, graphs, descriptions, goal-setting, team motivation, and management ideas. Safe & Secure! Order Online Today! 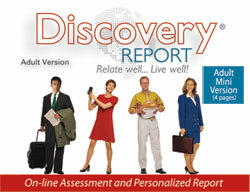 The Discovery Report is our most comprehensive personality test (assessment) product. This is our standard adult profile version. You will receive a 48-page computer-generated report (sent to you by email) that is highly accurate and easy-to-understand. The Discovery Report is based on the results of an online personality assessment that will take you only about 15-20 minutes to complete. It is packed full of helpful and practical information to help you to understand yourself and how to adapt to relate better to others. This is our best selling product. Some may think of this as a "personality test" or a "personality quiz." This is not really a test - you can not fail. There are no right or wrong answers, just your individual preferences. This personality report is very useful for business use and personal use. You will learn about your strengths, communication style, decision-making style and gain insights for relating with others and improving your ability to relate with others. "Discover Yourself" is an online personality test (assessment) for adults that generates a 4-page personality report. This version is a popular cost-effective assessment. Your personality report is customized based on your online assessment that will take you only about 15-20 minutes to complete. Concise, yet very helpful insights. Includes charts and your scores. Some may think of this as a "personality test" or a "personality quiz." This is not really a test - you can not fail. There are no right or wrong answers, just your individual preferences. Please note that, even though this is our "mini" version of the report, the online assessment is the same one that we use for the full report. One of the most accurate tools available for D-I-S-Covering teen's personality styles. Purpose: This assessment will help parents, teachers and individuals who work with teens better understand them, and for the teens to understand themselves and others by explaining tendencies. Description: A personality development handbook for teens. Here is one of the most accurate tool available for D-I-S-Covering your personality style. Purpose: To assess teen personality style for graphs and style blend. 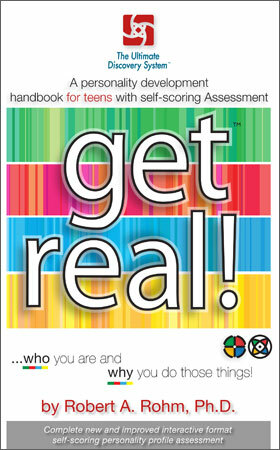 Description: Self-scoring personality style analysis for teens designed to define personal style as a basis for self awareness and understanding. Lists occupations associated with personality types and attributes. 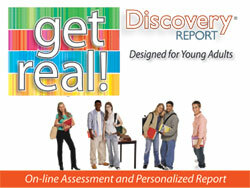 This special teen version of the Discovery Report personality test (assessment) is what we call our "Get Real" version. 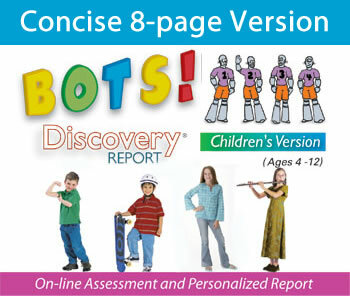 You will receive a personalized 58 page computer generated report that is highly accurate and easy-to-understand. The Discovery Report is based on the results of an online personality test (assessment) that will take you only about 15-20 minutes to complete online. Some may think of this as a "personality test" or a "personality quiz." This is not really a test - you can not fail. There are no right or wrong answers, just your individual preferences. This vocational aspect of this report is great for teens trying to figure out their strengths and how to leverage them for a future career. A new bonus has been added that will allow teens to use a special "Career Interest Explorer" tool that will allow them to narrow down a list of careers that fit them according to their personality. The career list can be saved for later reference. Teens can even research the careers by clicking on links which we have organized to be very easy to use. There is no extra charge for use of the Career Interest Explorer. 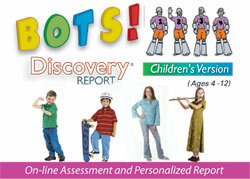 One of the most accurate tools available for D-I-S-Covering children's personality styles. Purpose: This assessment will help parents, teachers and individuals who work with children better understand them, and for the children to understand themselves and others by explaining tendencies. Description: Self-scoring human behavior style analysis graphing system designed to describe predictable patterns of behavior and how to relate to others. This resource material provides insights on tendencies as your child develops and matures. Additional insights are approaching instructions, motivational tips, and pointers on ideal environment and communication. Temporarily SOLD OUT!����� ����������������� Temporarily SOLD OUT! 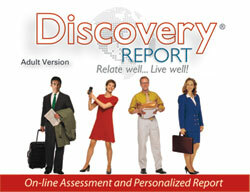 The Discovery Report is our most comprehensive personality test (assessment) product. This is the version for children ages 4-12. You will receive a 48 page computer generated report (downloaded file) that is highly accurate and easy-to-understand. The Discovery Report is based on the results of an online personality assessment that will take you only about 25 minutes to complete online. Pictures and stories make the process fun. There is a section in the report for the child, for the child's parents and for the child's teachers. Some may think of this as a "personality test" or a "personality quiz." This is not really a test - you can not fail. There are no right or wrong answers, just your individual preferences. Your child will love it! Purpose: Daily Inspiration for Christian Moms. Description: In this special addition to the bestselling Cup of Comfort series, you'll find touching, biblical-themed stories written by devoted mothers who have welcomed the Lord into their daily lives. Celebrating the God-given beauty, strength, and wisdom of mothers everywhere, these daily reflections will embrace and inspire you. Read Susan Crook's contribution for the month of August. Purpose: Easy-to-read and simple to use parenting charts for quick reference. 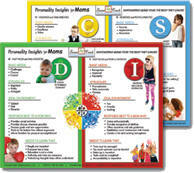 Description: Laminated set of 4 personality types. Practical tips on each chart that represents one of the four basic personality styles for a parent or teacher, and how to work effectively with each type of personality style. Charts provide insights on the strengths, struggles, and strategies to overcome potential challenges in working with children. 2019 Susan Crook Communications, LLC. All rights reserved.